Home button: tap it from any section to go back to the main menu. Story button: go to story mode. V-City button: go to the game special sections. 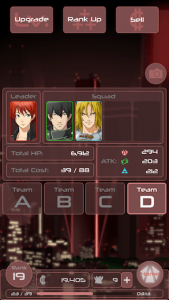 Team: to manage the battle team and upgrade, rank up or sell characters. Gacha: to draw new characters. (+) Options: access to the tutorial, help page and credits. Rank button: player information and stats. Announcements: latest news about Phobos Children. Social buttons: here you can access to the Phobos Children accounts on Twitter, Facebook, Instagram and to the user review player of the App Store. 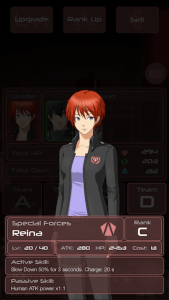 Special missions: there are two kind of special missions, Time Limited Missions and Events. Credits: amount of game money. Used to upgrade, rank up and buy part cards. Minerals: amount of minerals. Used to refill the energy bar, buy characters slots, draw rare gacha and continue when run out of HP. Mineral shop: here you can buy more minerals on packs. Player characters zone: your team zone. If the enemy orbs hit this zone, you will receive damage. Player HP bar: the HP of your whole team. Ready indicator: indicates if the character skill is ready to release. Enemy characters zone: the enemies zone. Enemy HP bar: the HP of each enemy. 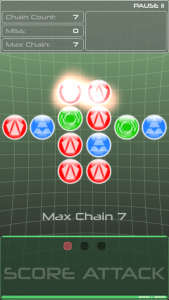 Enemy orbs: the enemy will attack you with these energy orbs. Orb counter: display the orbs you destroyed. If you destroy three of the same color in a row, you will attack the enemy. Max Chain counter: if, after destroying three orbs of the same color, you again destroy three orbs of the same color, you will do a chain. 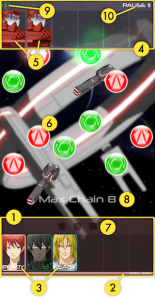 Connecting chains will improve your attack power, but missing one chain will put back your counter to zero. Received characters: sometimes, after beating an enemy, you will receive it at the end of the mission. Here you will see the number of enemies you got and their rank. You won’t receive the characters if you lose the mission. Pause button: to pause the game. 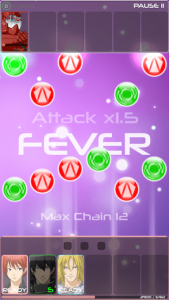 Fever mode: if you connect 12 chains, you will reach the maximum attack power (x1.5 times the original attack). The upper zone shows your performance on the stage: Chain Count (the total number of chains you made), Miss (the number of orbs that hit your zone) and Max Chain (the bigger number of chains you made without breaking it). Connecting chains will multiply your points. Note: getting hit won’t break the chain. 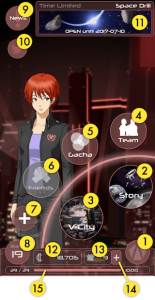 The story mode is divided in chapters, and each chapter in missions. You will unlock more chapters by going through the missions. Inside each chapter, there is a map with locations for the missions. 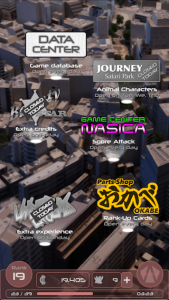 Inside each location there will be up to four missions, some of the main story, some substories from characters. Before entering in the mission, you will see the briefing screen. Here you will see information about which enemies are you fighting by the logos shown under the mission name, the selected team and again, the amount of energy required to play the mission. V-City is divided in shops. Some of the shops open every day, other only open some days of the week. Nasica (open everyday): Score Attack mode. 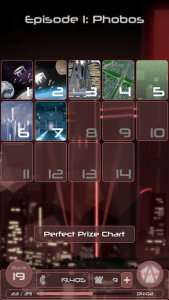 Here you can play to get the best possible score. You will get a price for getting a perfect (rank S++). Journey (open on Thursday for Human, Wednesday for Saia, Thursday for AIs): you can do missions for getting animals, used as an upgrade boost. There is different levels of difficulty, each with a different prize. The prize will respawn after getting it. The patterns inside the mission will appear randomly. Bounty Star (open on Friday): you can do missions for getting credits. There is different levels of difficulty, each with a different prize. The perfect prize will respawn after getting it. The patterns inside the mission will appear randomly. Underground (open on Sunday): you can do missions for getting extra experience points. There is different levels of difficulty, each with a different prize. The perfect prize will respawn after getting it. The patterns inside the mission will appear randomly. Parts Shop Okabe (open everyday): Here you will be able to buy part cards by using credits, used for ranking up characters. ??? : sometimes, a secret place is opened in V-City. If you find it, don’t miss the chance. It may disappear in any moment! Here you will be able to set up your Battle Team. You will be able to set up to four different teams, A, B, C, and D.
There is information about the total HP of the team, and the attack strength for each side. You also have a max cost. This limits the amount and rank of the characters you can use at the same time. Stronger cards have higher cost. Try to keep your HP and attack power as high as possible without surpassing the maximum cost. Keep in mind the character skills can be of great help during the battle. A long touch or a force touch (only on devices with 3D Touch) will show you the character information. 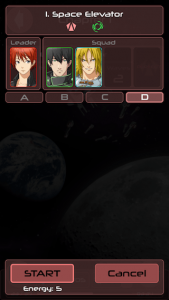 To take out a character from the team, swipe it up. You can erase all the characters except the leader slot. 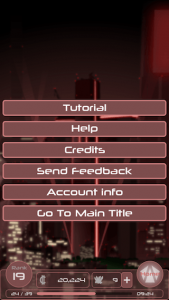 To add or change a character, tap on any slot. You will access to your character list. If you touched a character instead of a empty slot, it will show a “Selected”. 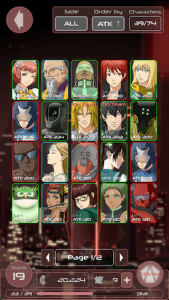 The characters on the Battle Deck will show a “On Team” banner. Tap on any character to put it on the battle deck. If the character was already on the battle deck, both characters will swap. If you touched one empty slot and touch a character that was previously on the battle deck, the card will move to the empty slot, except if it is the leader (it is not allowed to leave the leader slot empty). You can filter the characters by side, by attack, HP, level, cost and rank. The characters box show your current amount of characters vs the total available. If you overpass the maximum amount of characters, you won’t be allowed to play missions or draw the gacha. You can sell or upgrade characters, or buy more character slots (cost: 1 mineral). Here you will be able to upgrade all the characters but the animals (1 is their top level) and the parts cards. Tap over “Choose Character” to select the character to upgrade. 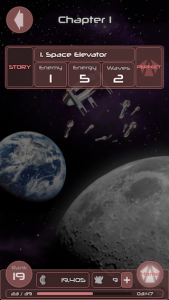 Then, tap on the right empty slot to add up to 8 characters to use for the upgrade. 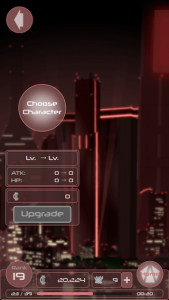 These characters will disappear after being used for the upgrade. Once selected, push the “Upgrade” button. You will get a warning when trying to upgrade with high ranked cards (B or upper). 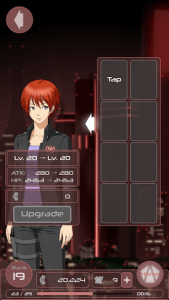 You can not use a protagonist (Reina, Shin or Achilles) to upgrade other characters. If you want to upgrade a different character, touch over the first character to change it. Upgrading cost credits. You can check if you have enough credits before doing the upgrade. You cannot upgrade anymore if the character reach his level max. 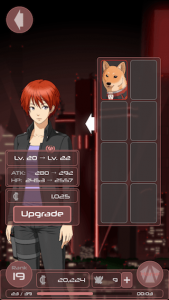 To make bigger the level max, you will need to “Rank Up” the character. Ranking up will allow you to make the level max of the character bigger. You can do it twice for each character. Rank will change showing a + for the first rank up, and a ++ after the second one. It is not possible to rank up further than that. 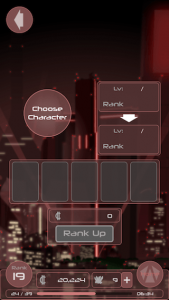 Tap over “Choose Character” to select the character to rank up. 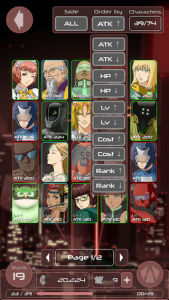 Under the character will appear the required characters and part cards to do the Rank Up. Please note you need to have the character at his top level. If you want to rank up a different character, touch over the first character to change it. Ranking up cost credits. You can check if you have enough credits before doing the rank up. Touch over an empty slot to select the characters to sell. You will be able to select up to 15 characters to sell. You will see how much credits you will receive for the characters. 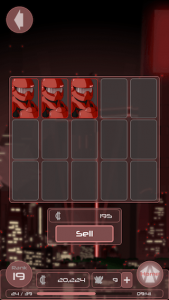 Press the “Sell” button to sell the characters. You won’t be able to sell any protagonist (Reina, Shin or Achilles). On the gacha section, you will be able to draw characters. 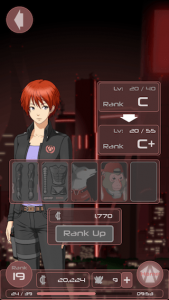 The characters you receive will appear randomly based on their rank. The higher the rank, lower probabilities to appear. The probabilities are displayed inside the “+ info” section (upper button). Rare gacha: for high ranked characters (B, A and S). 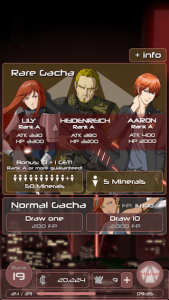 It cost minerals to draw: 5 minerals for 1 character, or 50 minerals to draw 10+1 characters (bundle). The bundle gacha guarantees at least 1 character of rank A or higher. Normal gacha: for low ranked characters (D and C). It cost FP to draw: 200 FP each character. You can earn FP on the missions, and also as a daily reward. If you have up to 2000 FP, you can draw up to 10 characters at the same time. 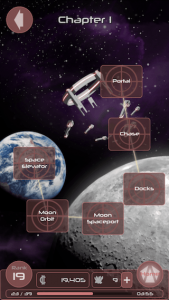 If you have more points and you want to draw more, you will have to push the button again. Not available on this version. Tutorial: to do the tutorial again. Help: to access to this help page. Credits: show the names of the creators of this game. Send Feedback: go to a web form to send feedback directly to the developers. Account Info: here you can assign an e-mail to your user account, so you can recover your password in case of losing it. Go to Main Title: go back to the main title.